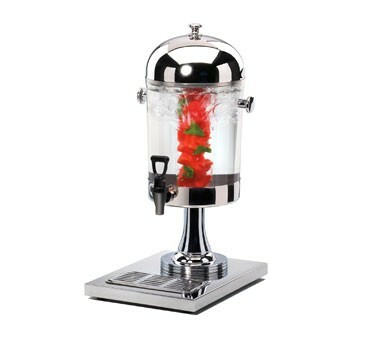 Perfect for serving fresh juice, cocktails, or water, the Cal-Mil 1010INF Stainless Steel Acrylic Beverage Dispenser With Infusion Chamber 2 Gallon is an indispensable addition to any buffet or catered event. Impress guests by creating a variety of signature drinks by filling its removable infusion chamber with sliced oranges, lemons, or other fruits. The small slits in the chamber infuses flavor into your chilled drinks while keeping pulp out of your customers' glasses. Thanks to its crystal-clear acrylic container, this high quality dispenser provides maximum product visibility while its spigot allows for convenient self-service. Boasting a stainless steel base and lid, this rust-resistant beverage dispenser is exceptionally durable, making it ideal for heavy duty use. Perfect for fast-paced food venues, this beverage dispenser has a built-in tray to minimize mess and a removable spigot for easy cleanup.